Monday, we are halfway through February and maternity leave has officially started – errr how did that happen?? At the moment I feel like I’ve got the treat of a Monday off work, it doesn’t feel like I won’t be going back for 10 months. I’ve had a productive morning so far as Mother Nature has decided that sleeping past 6am is for losers and it’s the best time to get up (please note the sarcasm). I stayed in bed until 7am but gave in, got up and since then I’ve vacuumed, mopped the kitchen floor, made a bit pot of Bolognese for the freezer, tidied up a bit, looked into what phone upgrade I can get, phoned the dentist and now I’ve sat down to type up this post and it’s not even 10am yet. 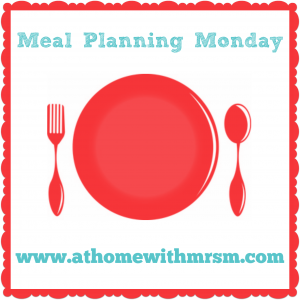 Doing this week’s meal plan was fun as for once I didn’t have to think about what was quick and easy to have after work or what would provide leftovers for lunch the following day. I can actually have a proper oven baked jacket potato for lunch or make a casserole that doesn’t involve advanced planning. Saying that I found it really hard to come up with meals as I’m so used to planning for a working week. I’ll be very surprised if bubs arrives this week but I’ve decided as off next week I won’t do a big shop or a meal plan, I’ll take each day as it comes as I don’t want to fill the fridge and be left with a load of food waste. Sunday – no idea, winging it haha! So that’s this week, maybe bubs will arrive early and I won’t write another one of these for weeks but knowing my luck I’ll still be here next Monday! It sounds like you have been so productive this morning! Go you!